Chinchilla is the ultimate in softness and beauty and is famous as "the fur of angels." 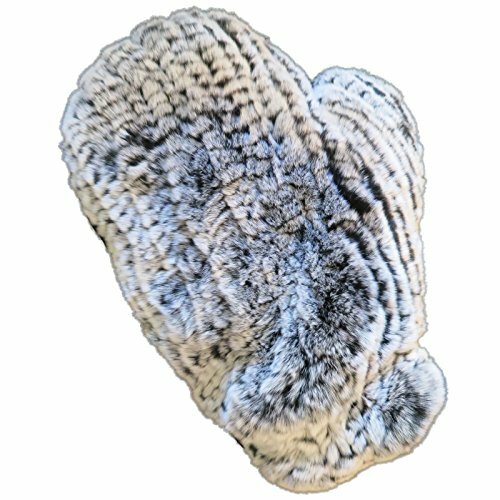 Our Knitted Chinchilla Fur combines amazing sensations of a more textured caress than whole Chinchilla yet retains the whisper light softness of Chinchilla Fur. The natural slate blue colored fur has a silvery gray top and dark incredibly dense underfur making it one of the lightest and delicate furs available, yet is durable and highly resistant to breakage. Chinchilla is one of the most prized, rare, and valuable furs and has historically been reserved for royals and aristocrats. This luxurious glove is best for softly stimulating strokes. Stretchy and elasticized knit retains shape and drapes beautifully with a lovely even texture. Chinchilla Fur is notoriously difficult to knit due to the rarity of the fur and special characteristics of the stunning palette of grey, black and white gradations. Feel the sumptuous touch of airy Chinchilla Fur inside and out. Soft sweeping slow caresses with our Knitted Chinchilla Glove imparts a delicious feel of softness and stimulation! Our packaging makes a gorgeous presentation. Soft Knitted Chinchilla Fur is protected in a beautiful presentation bag slipped into a plain envelope. Return address simply states "MG". No need to worry shipping to your office or ruining the surprise.